This event is free, but space is limited. RSVP is requested at ticket link. The year is beginning to wind down and tax season will be here soon. 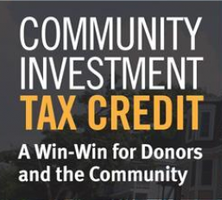 Share some breakfast with Habitat for Humanity of Wicomico County and learn about the potential financial advantages for individuals and businesses that may be gained through the Maryland Community Investment Tax Credit. This is a free event, but attendance is limited. Please click the ticket link to register.